INTRODUCTION: In 2009 I raved about The Laurentine Spy by New Zelander author Emily Gee, a novel that still remains treasured in my memory almost two years later. 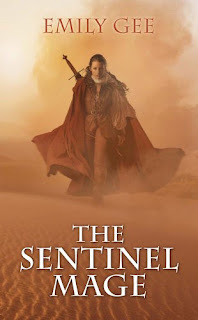 So when I found about her new fantasy, a series debut no less after two standalones, I was very excited and had very high expectations, considering that I included the novel in a spotlight with two of my top five expected titles of 2011. I liked the announced cover, while the blurb below was pretty generic and actually it turned out to be only partly accurate. However while the style of the novel was all I wanted and kept me reading, the content lacked depth badly and the book turned out to be a disappointment at least as my lofty expectations went, though further installments in the series may turn it around for me if they move the series beyond a "kill your enemies, get to the target" video game plot. "Her magic may be the only thing that can save a prince—and the Seven Kingdoms. In a distant corner of the Seven Kingdoms, an ancient curse festers and grows, consuming everything in its path. Only one man can break it: Harkeld of Osgaard, a prince with mage’s blood in his veins. But Prince Harkeld has a bounty on his head—and assassins at his heels. Innis is a gifted shapeshifter. Now she must do the forbidden: become a man. She must stand at Prince Harkeld’s side as his armsman, protecting and deceiving him. But the deserts of Masse are more dangerous than the assassins hunting the prince. The curse has woken deadly creatures, and the magic Prince Harkeld loathes may be the only thing standing between him and death." Despite all of the above, I enjoyed The Sentinel Mage more than the overview implies and I kept turning the pages - it's true that I kept hoping for something interesting, some twist, some depth - and that is the real "magic" of writing that the author has. The narrative flows well and you are compelled to turn the pages despite pretty much knowing what will be next and the banter between the main characters is entertaining quite a few times. The princess Britta is also very sympathetic and I hope that her story will take a more center stage in latter volumes. There are many avenues where things can go beyond the cliched one from this book and I hope the series takes some unexpected turns and acquires depth since the possibility is there for sure, while the author's writing style is just wonderful.